University Technical Colleges (UTCs) are a newcomer to the educational and landscape, and we are aware that there some misconceptions about them. Our colleges have been set up by employers seeking a pipeline of new talent with the work-place skills, industry knowledge and technical experience required. 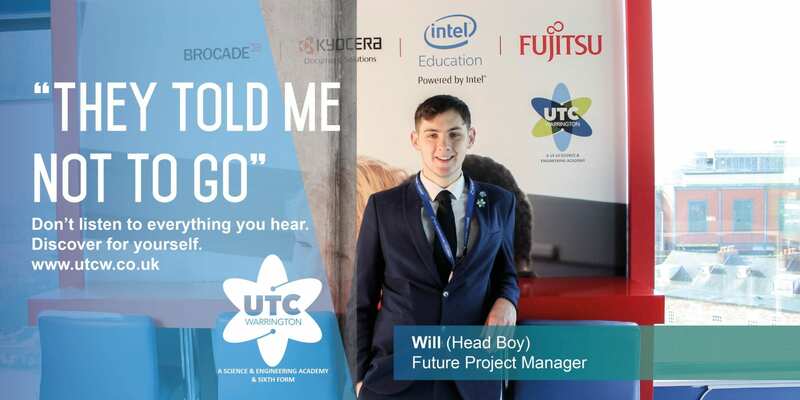 Government funded, UTCs offer a real alternative to the traditional education system that exists by allowing students to have an active role in choosing their future. 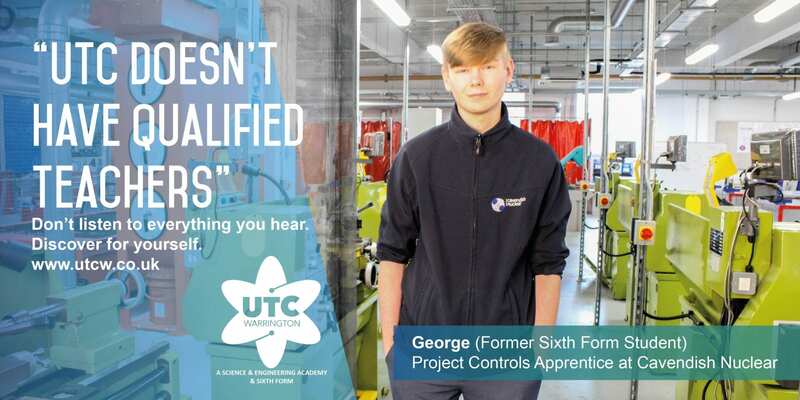 Since opening the doors to our £10m college in September 2016, UTC Warrington recognises there are some common misconceptions around what we and other UTCs provide for young people. To provide a clear perspective into the exciting STEM pathways available at UTCW, we have put together this Myth Buster to help answer your questions. UTCs are not suitable for high achieving academic students. Our students have gone on to study high quality STEM degrees in some of the UK’s leading universities, including Manchester, Southampton and Lancaster, alongside those graduates have secured STEM apprenticeships with companies including Wood Plc, Cavendish Nuclear, Nuvia and Kier Construction. 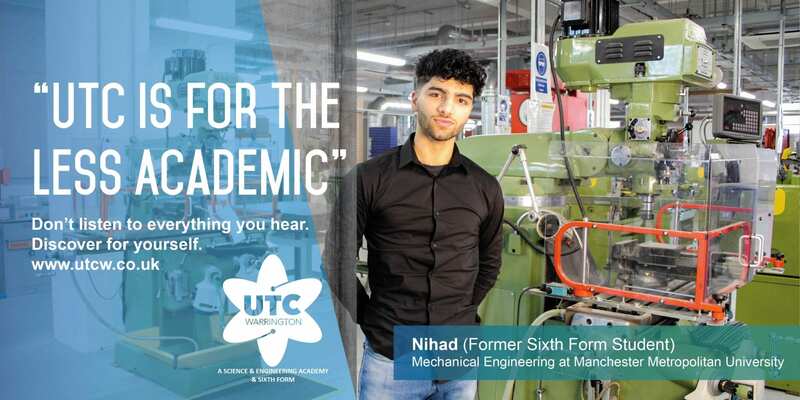 At UTCW, all of our students complete GCSEs that include Maths, English, Science and a range of high quality engineering subjects that are shaped around employer demand – Design, Manufacture, and Construction and Built Environment. At Sixth Form, students choose a specialist technical pathway that has been tailored by STEM employers to offer the academic and technical knowledge, alongside the professional confidence to equip graduates for University or a high quality apprenticeship. UTC graduates will struggle to find work. Destinations (young people going on to meaningful next steps and careers) are the reasons for UTCs existing. This focused approach to education was set up by employers and is common in the North West of England. 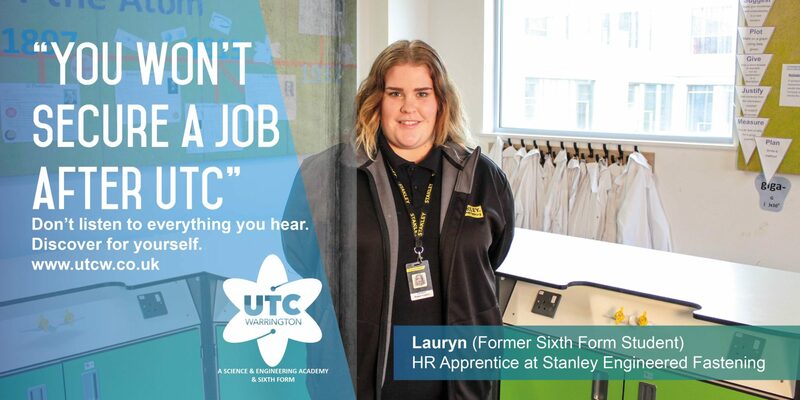 Students, parents, and employers say that young people leave UTC with strong workplace skills and a confidence that sets them up for future careers. For our Year 13 leavers, over half secured Apprenticeships or employment, covering a wide range of sectors (including Nuclear Engineering, Manufacturing, Civil Engineering). The percentage of students securing a high quality apprenticeship (higher or advanced) is over five times the national average. Not only are the UTC’s teachers trained and qualified, they bring with them a wealth of industry-background and teaching experience. We are proud of our staff team; our parents say that teachers go above and beyond to help the students follow their aspirations and bring their careers to life both during the UTC curriculum and when they leave us. With a smaller staff and student cohort, we build strong and positive relationships with our students. We have a dedicated pastoral team who oversee the welfare, development and progress of each student, and our teaching staff understand the strengths and barriers of each individual which creates a personalised learning experience. UTC students are poorly behaved. This is not true. We have a robust behaviour policy that reflects the world of work and industry, which sees students given verbal and written warnings before being removed from routine lessons if they are persistently disruptive. Our parents and students say that this makes a more positive learning environment and greater progress is made in lessons. Traditionally, careers in engineering and technology have been viewed as male-dominated. 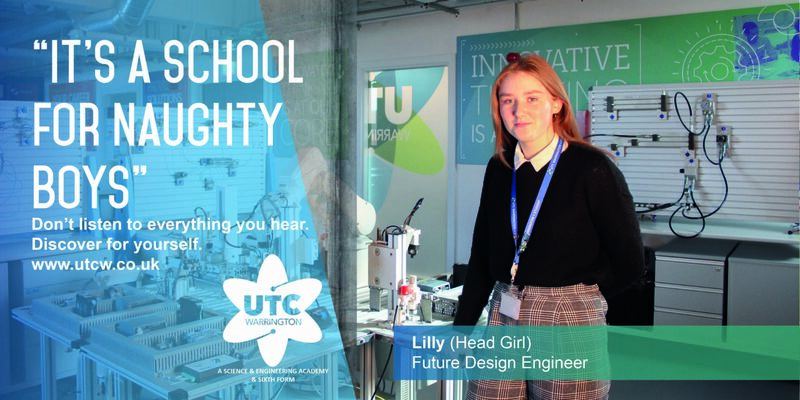 At UTCW, we work closely with our partner organisations to support female engagement in STEM, including specialist trips and lectures and our Women in STEM Events that are aimed at inspiring the UTC’s female students. Moving to the UTC is a bad decision. Students benefit from regular input and mentoring by local employers and Higher Education partners, as well as an opportunity to focus on specialist subjects that they are passionate about. 14 is the typical age that students start their GCSEs. We believe young people are mature enough to understand what pathway they want to follow. By opting for focused STEM qualifications at UTCW, students benefit from a wealth of industry expertise, outstanding facilities and a strong rapport with the region’s leading business leaders. Those who join us in Year 10 come from a number of different schools around Warrington and local towns. Our personal development programme brings students from all backgrounds together in a professional learning environment. What is a University Technical College? University Technical Colleges are a new concept in education. They offer 13/14-19 year olds the opportunity to take a highly regarded, technically-oriented course of study alongside academic qualifications. They are equipped to the highest standard, sponsored by a university and offer clear progression routes into higher education or further learning in work. What are the advantages of attending a UTC? It allows a student to study a subject they are really enthused by in top quality facilities that reflect the real workplace with teachers who have practical industry experience. Students also benefit from regular input and mentoring from local employers and universities. By 14, students are about to study their GCSEs. Those who know they want to follow a bespoke STEM career path have the opportunity to do so. Students receive a broad education including English, Maths and Science combined with practical and technical qualifications which are recognised by employers and universities. The skills they learn and the qualifications they receive are transferable to other post-16 provision and are recognised by employers. The curriculum is shaped by employers including Sellafield Ltd, Wood Plc and Manchester Metropolitan University so everything that students learn is connected to the world of work. Our focus on employability and career-readiness involves an extended programme of interaction with local and national employers who want to mould students into their future talent. Do UTC students perform poorly compared to those at other schools? As with any state secondary school, UTC Warrington is inspected by Ofsted. We have not been inspected yet, because the college opened in September 2016. Warrington Borough Council performance tables compare UTC Warrington to other schools in the local area using Progress 8 – measure of the progress children make between the end of primary school and the end of secondary school in eight sections of subjects that qualify for a performance score. As the UTC’s starting age is 14, the individual’s education experience prior to joining the college counts towards their final score. The five sections that are measured by Progress 8 and Attainment 8 make up the English Baccalaureate subjects – English, Maths, History, Geography and a language. Students at the UTC may not choose to study all of these subjects. The strongest aspects of our educational approach is the delivery of a unique, employer-led curriculum that allows students to boost their career prospects and learn new technical and employability skills. This is not recognised within Progress 8, leading to a lower overall score. Yet we know that our students’ continuously exceed expectations during their time with us. Does UTCW support those students with additional needs? The UTC has staff who specialise in students with special needs and the building has been designed to provide access for all. Please speak to our Assistant Principal for Inclusion about any additional needs your child may have to ensure we can support them. Will free school meals continue to be available? All students eligible for free school meals with retain their entitlement. Please speak to the finance team for further information. Does the UTC have entry requirements? Year 10 – There are no formal entry requirements to join us at Key Stage 4, however an interest in Engineering, Science and Technology would be advantageous. Year 12 – Students must achieve a minimum of a grade 4/C to secure their place on one of our Year 12 pathways. For A Level subjects, a grade 6/B must be achieved. © 2019 UTC Warrington. University Technical College Warrington is a registered charity and a company limited by guarantee registered at the above address in England and Wales. Registered Charity No EW66360 · Registered Company No 8714780 A paper copy of all the information on our website can be provided on request.